Munir Bashir, who died in 1997 was without doubt one of he most celebrated musicians in the Middle East during his lifetime. He was a master of the Oud and a virtuoso of improvisation that combined Middle Eastern musical theory with his interest in both Asian and European musical theory. He was born in Iraq but to escape the wars and conflict in the country he was obliged to live the life of an exile in Europe, mostly in Hungary. Munir Bashir was born into a musical family in Mosul. His father, Abd al-Aziz was a poet and musician and his brother Gamil also became an accomplished Oud player. He learned the violoncello and the Oud from the age of five along with his brother Gamil. At the age of six Bashir’s excpetional talent was recognised and he was sent to the Baghdad conservatory, which was run by Iraqi musicologist Scharif Muhyi ad-Din Haydar Targan. In 1951, Bashir started teaching at Académie des Beaux-Arts in Baghdad and also worked as an editor for the Iraqi broadcasting company. But the military coup that toppled Faisal II in 1958 marked the beginning of Bashir’s work abroad. His started working in Beirut where he accompanied the Lebanese singer Fairuz and carried on teaching as well. In 1953 he started performing as an independent artist and his first concert as a soloist took place in Istanbul, which was followed by appearances on Iraqi television. He was slowly becoming a celebrity in muscial circles. He moved to Budapest in 1960 where he married and had a son Omar who also became a musician. In 1987 — despite the ongoing Iran–Iraq War — Bashir managed to set up his project, the Babylon International Festival of Dance, Music, and Theatre, which he ran for several years. Bashir did not spend much time in Baghdad and continued travelling and performing, finally leaving the country after the First Gulf War in 1991. He frequently performed in Europe and began playing with his son Omar which culminated in what is considered his best work, a duo-recording of father and son made in 1994 which is a beautiful mix of the traditional with more progressive improvisation. 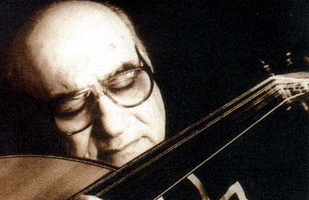 Munir Bashir was a master of the Oud and was responsible for eventually seeing the instrument evolve into a solo instrument with his, some say, jazz-like improvisational skill – “Taqsim”. Especially in the field of solo improvisation he was considered an unsurpassed master and it is as a result of his pioneering work that oud players can today give solo-concerts. Munir Bashir died of heart failure in 1997 in Budapest at the age of 68, a short time before his planned departure for his Mexican tour.